ROCHESTER – Over the past 12 months great gobs of people across the globe have become victims of the mischievous, masquerading as the liberators of word and thought. What ever happened to an affectionate curiosity for far-flung customs, a respect for alien cultures, a sensitivity to that which might cause offense? Old hat, me boys! This is the 21st century. Let’s have a laugh. Let’s dance on the other guy’s hallowed ground and watch him fizz. Thus, whole navies of fine fellows have steamed out of port under the Freedom of Speech flag to rake foreign shores with barb and jibe. International tensions have been raised to bubbling point, and foreign trade has suffered. Retaliatory death threats have been lobbed around and, if it wasn’t for me - me, I say - Rochester would be right up to its neck in it, facing the ire of five million, rabidly frothing … but I’ll get to all that in a minute. Back in September 2005, the Danish newspaper Jyllands-Posten saw fit to tick off people all around the world by publishing a dozen cartoons that were blasphemy in the eyes of a few Danish imams and Muslims by the millions, shortly after the imams went on tour. There were nasty riots, dozens of folks died, Denmark’s commercial exports took a bad hit. Iran played the next card in the cartoon game, perhaps concluding that Freedom of Speech trumps ticked-off people. Or, more probably, they hoped that if the Ticked Off ones are also the Free Speech Believers, the result might be an apoplectic silence, a soundless fizzing. Either way, the Hamshahri Daily helped administer an international cartoon contest featuring prizes, with the Holocaust as the theme. Apoplectic silence? Some hopes. The Israelis sprang into action as follows: In response to Iran's best-selling newspaper announcing a competition to find the best cartoons about the Holocaust, the Israel News Agency launched an SEO - Internet search engine optimization marketing contest to prevent Iran news websites from reaching top positions in Google. Then, while in Germany, the Pope got the Muslims all fired up again by asserting, or rather quoting someone else’s assertion, that theirs is a violent religion. Funny how no one can remember the Crusaders ever handing out Halloween candy, and records of knights in shining armor helping old Arab ladies cross the road to the bazaar are quite scant. But, you ask, what on earth has this all got to do with Rochester? Pinus sylvestris is what, buddy! Pinus sylvestris, the species of tree known throughout the civilized world as the Scots Pine and the largest specimen of which, in New Hampshire, sprouts in a backyard off North Main Street. Rochester Times readers learned, a few weeks ago, that this specimen had been re-measured by a trio of tree officials. In fact, those readers may recall my photograph, taken at ground level, of Rochester’s Scots Pine, rearing abruptly skyward, as several faces of officialdom peered over into the camera lens. The online encyclopedia, Wikipedia, in its useful synopsis of Pinus sylvestri, informs one that this ancient species is Scotland’s National Tree, and remnants of the original Caledonian forest comprised of noble Scots Pines are greatly revered by the Scottish nation. At this juncture, if you’ll allow me just a second or two, I would like to refute, for the record, a scurrilous charge that in 1981 I destroyed a small portion of precious Caledonian forest in a bonfire, while drunk. Those were dead trees, Mr. Stick-your-nose-in from Aberdeen. Anyway, back at Wikipedia, after discussing the Scots Pine’s history, distribution, reseeding habits, value as timber and much more, the encyclopedia issues the following stern warning: The name is sometimes mis-spelled 'scotch', a form which gives offence in Scotland and should be avoided. Scotch Pine? Elevate that to "grave offense". In preparation for writing the Rochester Times tree measuring article, I visited the University of New Hampshire Cooperative Extension Service’s Big Tree site (http://extension.unh.edu/forestry/documents/STACOUNT.pdf) to check on the previous measurements of Rochester’s Scots Pine, whereupon I found, to my horror, that Scotland’s sacred tree was blatantly listed as the Scotch Pine. My blood ran cold. I envisaged old Mr. Ramgunshoch, the infamous Scottish grump exiled in Farmington, beside himself with rage, issuing some kind of Gaelic fatwa and urging the clans soon to gather at Loon Mountain to march, with targe, claymore and skirling bagpipe, on the Thompson School of Forestry in Durham. Ramgunshoch must never learn of the serious national insult, "Scotch Pine", I thought, and according, in the name of peace, wrote the correct name throughout the Rochester Times story. "But," I ruminated later, " it’s only a matter of time before one of Scotland’s five million touchy citizens stumbles upon the UNH Extension Service web page, and bingo, before you can say ‘Scots Pine, ya bas,’ New Hampshire is embroiled in the latest international upheaval, with Rochester its epicenter." That Big Tree page has absolutely got to be corrected, I thought, and shared my concerns with Strafford County Forester Don Black, when I met him at Rochester Fair. I also explained that in the last few hours the matter had taken on an even greater urgency because the Farmington cartoonist Stephanie Piro had somehow got wind of things, and had already drawn her take on this tinderbox situation. 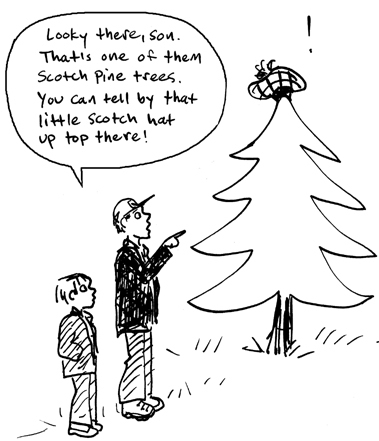 A Scotch Pine cartoon - Denmark, here we go! Mr. Black, a UNH Extension Service guy, was sympathetic but, with a duck-and-weave maneuver commendable in a man almost seven feet tall, alleged that the Official Namers of Trees around these parts were the crowd over at the Society for the Protection of New Hampshire Forests in Concord. I called the vice president of the SPNHF, Jack Savage, and explained the need for swift remedial action regarding the badly maligned National Tree of Scotland. Seeming to realize the international implications of the Scots vs. Scotch Pine business, Jack promised to confer with his woodsy colleagues and get back to me by noon. He was as good as his word, but the word was not good. "We (the Society for the Protection of New Hampshire Forests) have no objection to changing the name. We are neutral. The problem is the New Hampshire and Vermont Christmas Tree Growers Association. They sell the Scotch Pine. They have branding," said Vice President Savage. Branding! The word fell on my ears like a bombshell. 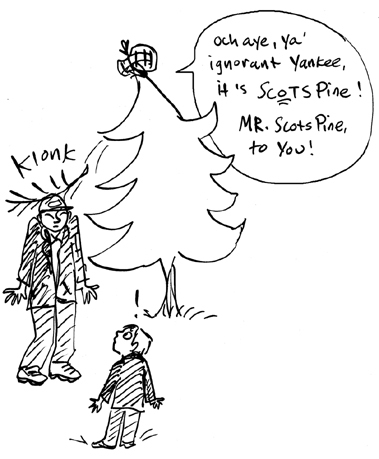 Half a dozen New England tree farmers had invested advertising dollars in the "Scotch" Pine, and to change the name to "Scots" might throw customers into confusion. Knowing that profit will always triumph over protocol and propriety, I decided to break the news to old Ramgunshoch. "And don’t even think about damaging a single tree farm sign, or Bush will be call it terrorism and 20,000 Marines will be wading ashore in Greenock," I warned the testy Scottish exile, as he spluttered into a glass of Scotch whisky, and turned purple with indignation. "This is the only thing that’s called Scotch," he yelled, waving the tumbler. 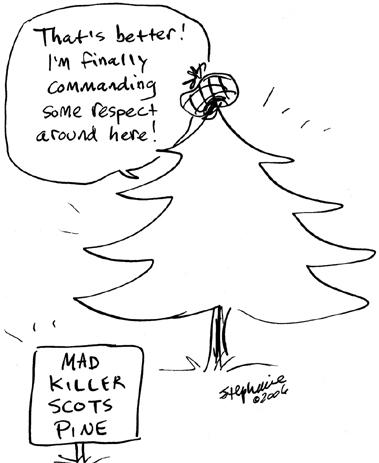 Rather than placate the situation, each "Scotch" seemed to have increased his fury. Ramgunshoch had risen from his chair, grabbed a handy cromach, and was now bearing down, stick in fist and murder in his eyes. I fled. In closing, I issue an impassioned appeal to the New Hampshire and Vermont Christmas Tree Growers Association. In the name of world peace, please drop the "ch" and add an "s". Perhaps Muslims have a reason to gripe when the Prophet Mohammed’s turban is depicted as a bomb, and maybe the Scots have too, they who fought the English for 300 years, only to make peace and then be abused as a nation by Samuel Johnson (among many others). "The noblest prospect which a Scotchman ever sees, is the high road that leads him to England!" wrote the English wit, deftly fitting two insults in the one sentence. Johnson would say stick with Scotch Pine and watch ‘em fizz. But maybe tree farmers are kinder than that.